Rebecca has been involved in theatre since fifth grade and wanted to attend a college that would provide her with a top-notch theatre education while simultaneously strengthening her faith. 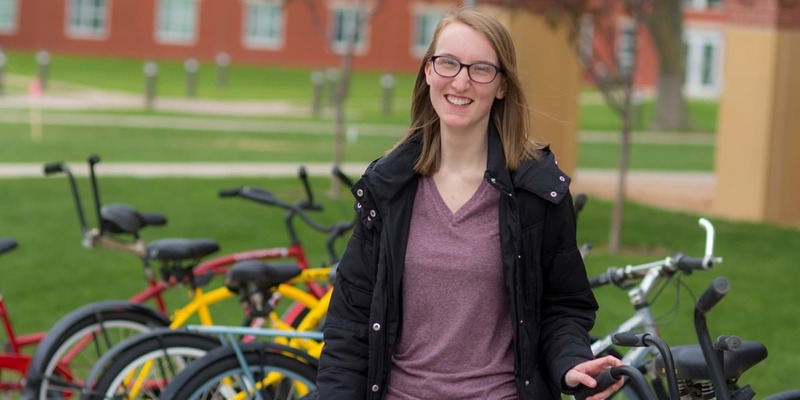 After visiting Northwestern and experiencing the welcoming community on campus, she was hooked. Now, she’s a member of the Black V student improv group, a speech fellow for the college’s First Year Seminar program, and a student representative for the Northwestern Core Committee. Although she loves to perform, she also enjoys working out of the limelight and hopes to secure a job as a stage manager after graduation. I became interested in theatre because I love to tell stories, especially ones that need to be told. I also love that feeling of being taken to another world for a while to learn new perspectives. Plus, who doesn’t love a major where you get to have fun all the time while learning incredible life skills like how to build things or communicate and work with other members of a team? I am majoring in theatre not only because I love theatre, but because it teaches you more than I ever thought possible about life skills I can now carry with me no matter my future career. I appreciate how caring and intentional the faculty is. They want to get to know you as a person first, and from there, help train you to become a better theatre artist. With a smaller department, you have a lot of opportunities to learn what you want to learn from faculty who know what they are talking about. The professors expect you to work hard, and their doors are always open to help you in any way they can. We have a saying in the department, “To the King,” meaning that we give everything we do to God. Studying theatre has also taught me what it means to truly have a servant heart. Sometimes you have to put others and their needs first for the betterment of the production and serve in ways that may not always be totally comfortable for you. I’ve learned through studying theatre at Northwestern that God speaks to us through stories, and we can seek God and glorify him through using our talents to tell stories to connect with other people. In this department, you will learn every aspect of theatre and how important each is, along with how they work together. Since coming to Northwestern, I have learned how to use power tools, hang lights, sew a costume from a pattern, read a ground plan, create a prompt book, and the list just goes on and on. You are able to get your feet wet in every part of a working theatre and learn what you love to do by getting to try a little bit of everything. You don’t always get the same opportunity at other schools.